The above quotes all show just how important discipleship is – to the church, for individuals, and especially for us to carry out the directive from God: Go, therefore, and make disciples of all nations (Matthew 28:19). By making Discipleship the Portal Priority of your Men’s Leadership Team (and your church), we can focus on helping men love God with all their heart, mind, soul, and strength and even love their neighbors as themselves. As men grow closer in their relationship with Christ, then the behaviors will follow. In making Discipleship the Portal Priority, we can focus on making disciples and not on the work to be done. When we focus on “making disciples” rather than “making workers,” the incidence of ministry “burn-out” is greatly reduced! Disciples become workers out of the overflow of their growing relationship with Jesus Christ. Making discipleship the portal priority of our churches is the answer to what ails us. Consider our many systemic problems: divorce, fatherlessness, unwed mothers, drugs, alcoholism, abortion, crime, suicide, poverty, truancy, cheating, and disrespect for authority. They all need attention. Beneath everything, though, is the need for a discipleship reformation of the Christian church. What single activity would have the greatest impact on all of these problems twenty years from now? Discipling men now! As a Leadership Team it can be easy to get distracted and focus on what “new and innovative” program will attract the most men to a one-time event. It can be easy to focus on the need to fill the different slots for workers and then pray that somehow, someway, one of the men might become a disciple. Leadership Teams who keep Discipleship as their Portal Priority have found that it is the way to achieve the other priorities of the church. By moving their men through the discipleship gateway, they can truly affect their church and community. As a Leadership Team remember, Discipleship is Job One for your church. 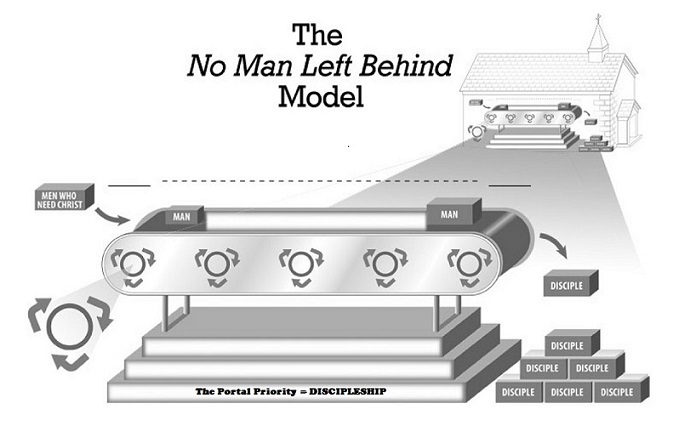 Making disciples is the “portal priority” through which all the other priorities of your church are met.